“Wow, it’s bigger than I expected!” I hear people say this all the time… They say this after seeing some of our glass sculptures in person for the first time. Why is the perception of an object’s size often different from the object’s ‘actual’ size, or ‘actual’ dimensions? Does size matter? I have some thoughts and tips to better visualize the actual size of an object.. Because size does matter. People can often be surprised by the actual size of our glass work. This is because they have only seen photos of our work. They have seen the images of our work in magazines and on the web, including our website. 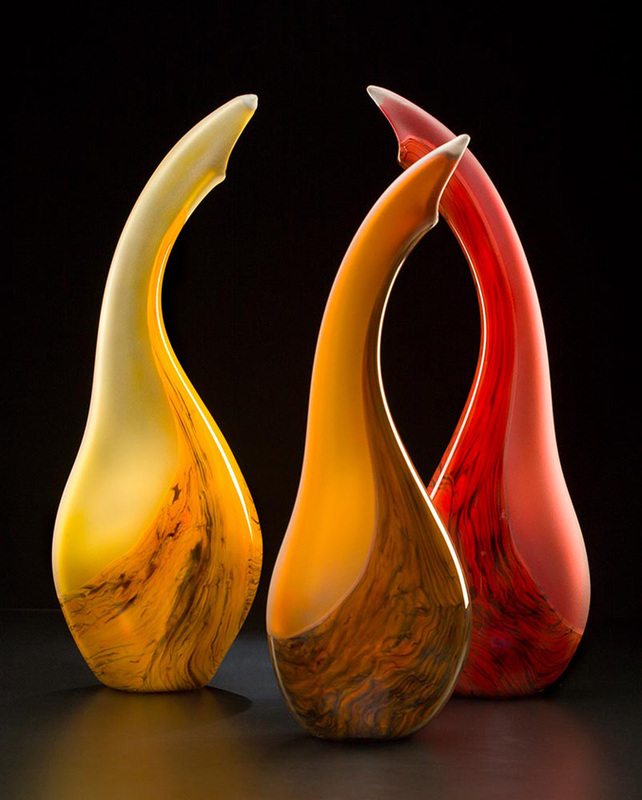 We do list the dimensions of our glass work on our website… But people still seem to be surprised when they see the work in person. There are many reasons why people might think the size of an object is either bigger or smaller than its actual size. This happens most often when viewing an object in a photograph. Photographs of very familiar things, like a car, are much easier for people to perceive the actual size of the object. If I see a car in a photo, I’m pretty confident about how big the car will be if I saw it in person. Photographs of unfamiliar or unique objects such as one-of-a-kind sculptures, are harder to visualize the actual size… Even when the dimensions are given. 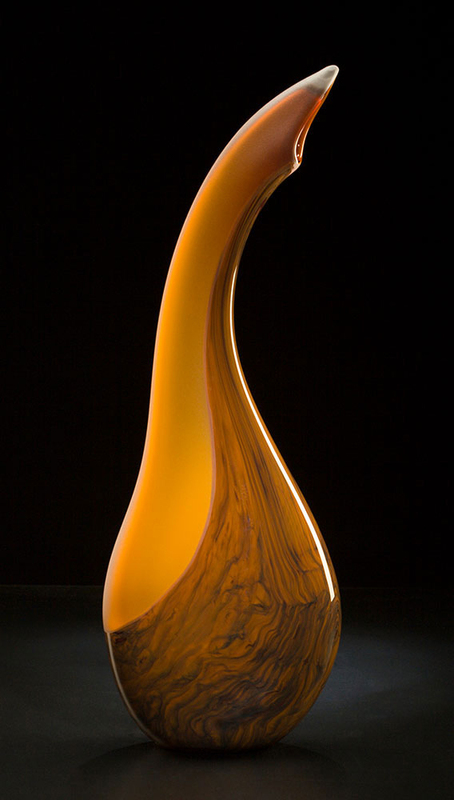 Often I see artwork, art glass, and sculpture in photos without any listed dimensions. This make it almost impossible for me to tell how big something actually is. When a photo of a sculpture includes a ‘reference object’ within the photo, it is much easier to tell how big or small the sculpture actually is. A ‘reference object’ is something that is very familiar to most people, such as a coin, chair, or person. Yes, I know, people can be very tall or very short, and coins can vary in size… But these things are generally within a familiar size range. The object and ‘reference object’ should be about the same distance from the camera. Objects with a length and width plus a depth are obviously larger than a flat object with very little depth. An object with a certain amount of volume tends to be perceived as being much bigger than its actual measurements. In the photo of me holding a large trash can, the trash can looks fairly big. If I told you the trash can is only about 26″ inches tall, you might be a little surprised because it looks bigger. 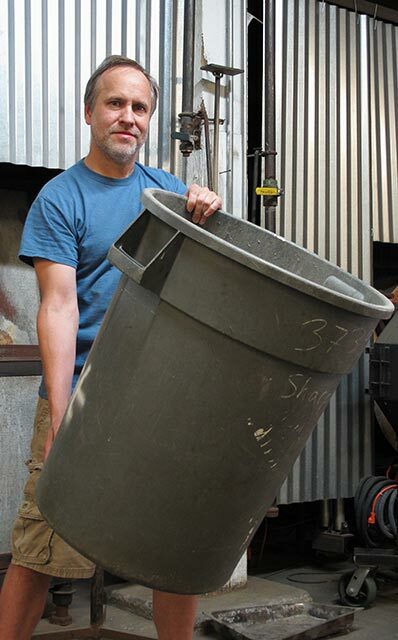 We have had customers ask us to make hand blown glass vessels as big as this trash can. Sometimes, they did not realize how big a 26″ x 20″ glass vessel would ‘actually’ be. It can be hard to mentally visualize a glass vessel being this big just based on the measurements… Which is why a familiar reference can be helpful. 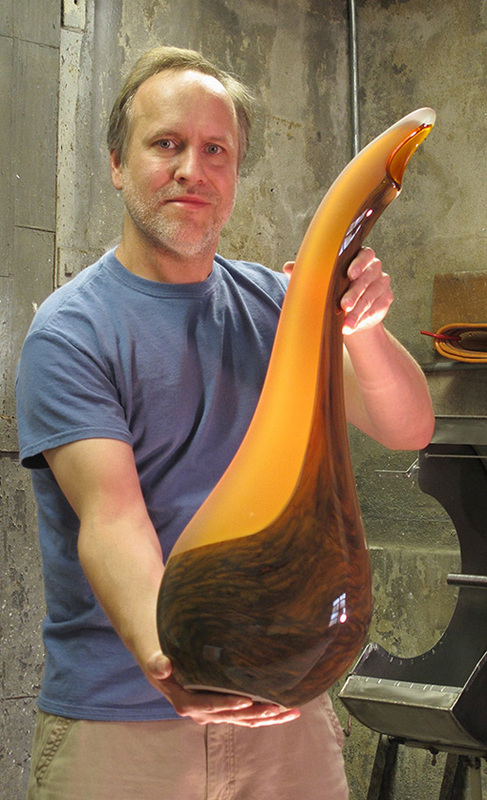 Pictured above, I’m holding a Salinas glass sculpture which is about 27″ inches tall. It is a little taller than the trash can. However, the trash can looks much bigger than the Salinas glass sculpture. This is why volume can be hard to mentally visualize with just a set of measurements and no reference. By the way, did you notice that you probably have a better idea of how big the Salinas glass sculpture is because I am holding it? It is tempting to just guess for example, how long 2 feet would be… But using a ruler or tape measure will be far more accurate than guessing. *Quick Tip – If you don’t have a ruler or tape measure handy, a dollar bill is exactly 6″ inches long. You may be concerned with how an object or sculpture will fit in a particular place. I recommend using a piece of paper, cardboard, or foam board cut to the size of the artwork. You can better visualize the scale of the work using this method. Objects or sculpture with some volume will take up more area. I recommend using something with volume such as a pillow, cushion, or even an empty box. Doing something like this will definitely give a clear idea of the size of the sculpture… And how well it will fit once it is in place. Does size matter? If it matters to you, then hopefully these tips are helpful.